I always wondered about these zucchini, squash, carrot (and whatever else) raw noodles. Now, I know, and you will too. This is seriously tasty knowledge, people. I recently purchased my first spiral slicer by Helen’s Asian Kitchen on Amazon and I couldn’t be more pleased with a kitchen gadget. It only costs around $20 including shipping and definitely does the trick for the price. This little gem slices firm vegetables into long ribbons on one setting, and fine angel hair “pasta” on the other. My absolute favorite raw vegan restaurant, Vida de Cafe, located in St. Pete Beach FL has an amazing raw Pad Thai on their menu. (Definitely gorged on that this weekend at Tampa Bay VegFest). This was my attempt to recreate the simple goodness of their awesome entree. I am definitely going to be using this little spiral slicer for many, many things. I am imagining quick dinners in the evenings, fast lunches on my days off, and who knows what else. Just FYI though, it doesn’t work on mushy vegetables like tomatoes; it works best on firm ones like zucchini and squash. This satay sauce is really similar to the one I made for my Thai Summer Rolls, but a much thinner consistency. Combine all ingredients and mix well. I’d probably add the hot water last after you’ve already started to mix everything else together. The heat of the water will help the peanut butter melt a little and mix better. Set aside while you make the noodles. Now, how do I make those zucchini noodles?!?! It’s seriously easy. 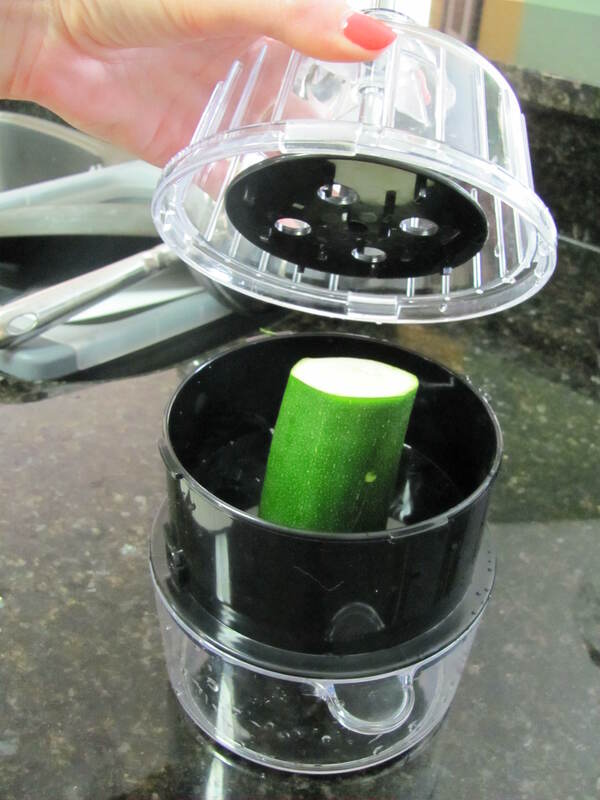 The spiral slicer only allows about 3″ to 3 1/2″ of vegetable in there at once, so slice the veggies accordingly. Slice ends off zucchini, then slice into 3″ to 3 1/2″ long sections. Place zucchini vertically on the little spike inside the slicer. Make sure the slicer is set to the spiral setting, or it will cut long ribbons and not the “noodles.” There is a little tab on the side that must be turned to make the spiraling blades go up. Place the top on the slicer, making sure the little spikes on the top piece go into the veggie as well. Press down and turn the handle clockwise. The reservoir on the bottom will fill with your raw, fresh zucchini noodles! I ate two bowls of this stuff today. One 3″ section makes a small bowl. I added chopped red cabbage, too. Top with peanut sauce, more fresh cilantro and lime wedges. Maybe even some raw bean sprouts and shredded carrot, too!